The Rangers made an organizational change to become more defensive-minded behind the dish when they let Robinson Chirinos go in favor of Jeff Mathis. We started with our 2019 Position Previews on the mound, looking at the starting rotation. Next, we’ll progress to the position that will see the most meaningful change to the club – Catcher. 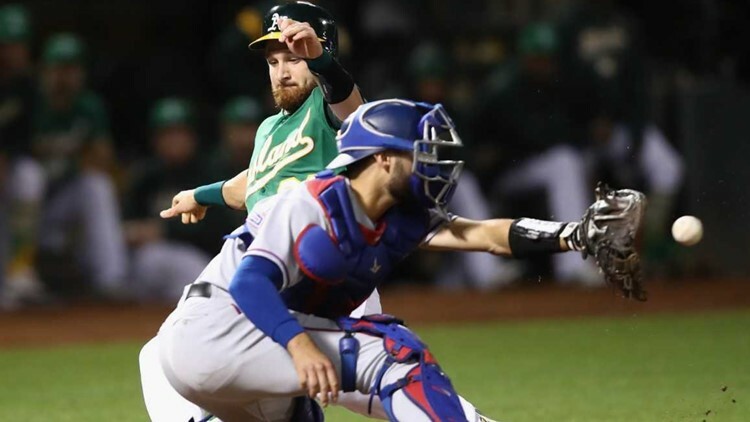 Coming into the 2018 season, the biggest question surrounding the catching situation in Texas was whether incumbent receiver Robinson Chirinos could stay healthy enough to assume everyday duties. He already had a good rapport with the staff and was recognized as a very studious game-caller, albeit with limited pitch framing ability. Over his entire career, Chirinos hadn’t had a season of more than 100 games behind the plate due to various injuries. Perhaps surprisingly, the then 34-year old delivered on the durability front, despite some scares. Through the season, Chirinos took his share of bumps and bruises. Not only did he suffer the normal knocks from his position behind the plate with foul balls, backswings and the like, but Chirinos also endured a career-high 19 hit-by-pitches at the plate. There were several moments where it looked like Chirinos would have to hit the DL, including a stretch early in the year where he was consistently bothered by a left wrist issue he incurred during a play at the plate. He was able to avoid missing significant time, though. Offensively, Chirinos had a down year, comparatively, but still provided a decent enough on-base percentage and above .400 SLG, justifying his presence in the lineup. But perhaps that early wrist issue was the cause for his lower overall numbers. Despite posting career-highs in hits, homers, and runs batted in (80, 18, and 65), Chirinos also posted a career-low batting average – a result perhaps of more appearances at the plate – of .222 and his strikeouts skyrocketed to 140 in 113 games. Defensively, Chirinos has never been a top of the game catcher, usually praised for his preparedness but never for his execution. He also was not effective at preventing the running game, despite increased reps behind the plate. At backup, the position was actually in flux for much of the early part of the schedule until the advent and emergence of Isiah Kiner-Falefa as a legitimate catcher. IKF only caught 35 games, but that was tops among the backups for the Rangers. Top catching prospect Jose Trevino had a nice moment over Father’s Day weekend with Texas when he drove in the winning run in a wild 13-12 walk-off victory over the Colorado Rockies mere days after he himself became a father. Trevino was up only as a precaution though and only started one game before returning to the minors. Carlos Perez and Juan Centeno were the other two who the Rangers tried in backup roles but they ended up being unremarkable and unrememberable. 2019 is representing a rather drastic departure from previous catching philosophies. Over the last several years, Texas has focused on average to below-average defenders – Jonathan Lucroy notwithstanding, but he also severely underperformed throughout in 2017 – who can provide a measure of power with the bat. By opting not to pick up the incredibly cheap option on Chirinos and signing the older Jeff Mathis to be the primary backstop for 2019, the Rangers are focusing more on defensive practicality and mentorship for the next wave of catchers in the system. Mathis has spent his career traveling around with the Angels, Blue Jays, Marlins and Diamondbacks, always as a reliable backup treasured more for his defensive ability than his bat. That said, he fits right in with the direction Texas is looking to go, as he is considered one of the top fielders at his position and has a reputation around the game for being able to help his team around the margins with his quantifiable skills behind the plate. That said, Mathis is a career .198 hitter, has never hit more than nine home runs in a season, and has never played in more than 94 games in a single season with a high water mark of 73 games since the 2011 season. Around the game, however, he is regarded as an excellent pitch framer, dirt-ball blocker and controller of the run game. The Rangers are banking – to the tune of two-year, $6.25M – that those ethereal abilities will be worth more in the overall scheme of things than his career 52 OPS+, the worst mark among those with at least 2,000 trips to the plate since his debut in 2005. Did Texas bring Mathis on to work closely with its rotation? Featuring veteran names like Mike Minor, Lance Lynn and Edinson Volquez, that’s not really the focus, though they should benefit from his skillset. Instead, look to unseasoned Kiner-Falefa, as Texas shifts his focus to primarily behind the plate. The utility fielder can certainly serve as depth in the infield, but the Rangers liked what they saw out of IKF as a backup behind the plate last year. However, Kiner-Falefa is still learning the position and Mathis is someone you’d want to have at your side as you’re trying to absorb the ins and outs. Then there’s Jose Trevino, who is already a highly-thought-of defensive catcher, being groomed to be potentially the next franchise catcher. Trevino’s game is like Mathis’, defense-oriented and offensively-deficient. Instead of trying to even out the bat, the Rangers are going to buy all-in to the minor league Gold Glover’s skills behind the dish and have brought Mathis in to elevate those strong points with a wealth of experience and a full bag of tricks. Kiner-Falefa may serve as primary backup for the 2019 season, but Trevino is going to see more than just three total games of action this year. Kiner-Falefa may be pressed into service in the infield by injury or time off and he may be pressed into more duty behind the plate for the older Mathis who has never really held a starting job for a full season. 2019 might be about Mathis gradually passing the torch to Trevino who is going to get a better look ahead of the team’s venture into the new stadium. Do you think the Rangers made the right call to essentially swap Robinson Chirinos for Jeff Mathis and focus on defense behind the dish? Share your thoughts with Matt on Twitter @FisherWritesMLB.